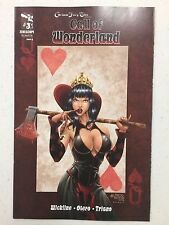 Grimm Fairy Tales ALICE IN WONDERLAND #3 (NM) ALE GARZA Secret Retailer exc HTF! Grimm Fairy Tales Wonderland 2012 Annual Cvr A. Comic Book Zenescope Nice Copy! This page was last updated: 20-Apr 22:29. Number of bids and bid amounts may be slightly out of date. See each listing for international shipping options and costs.